This gorgeous summer salad was a big hit at Christmas dinner, and despite its name, it would be great at anytime of the year. Like the rest of my entertaining recipes, this salad is super simple to prepare and can be made ahead of time. 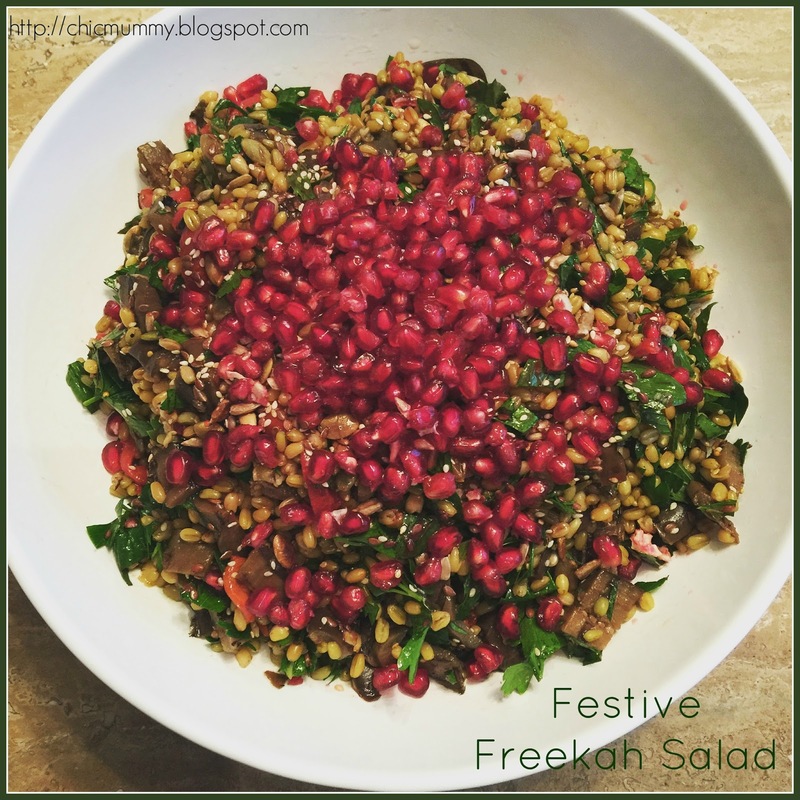 Freekeh is a “trendy” grain at the moment but don’t let that put you off – it is nutty and delicious and chewy, making it perfect for a substantial salad. Freekeh is toasted green wheat, but if you can’t find it, feel free to substitute brown rice or barley – the salad would still be just as yummy. Put the freekeh, bay leaves and cinnamon in a large pot together with plenty of water, and boil for 45 minutes, adding more water if necessary. The freekeh should be tender but still chewy, with a bite to it. Drain, and leave to cool. Remove bay leaves and cinnamon quill. Place all remaining ingredients except pomegranate into a large bowl and toss to combine. Taste and adjust seasonings as required. Pour into a wide but shallow serving dish. Cut pomegranate in half, and holding cut side down over salad, bash the pomegranate with the hilt of a chopping knife or a large spoon so the arils and juice fall over salad. Serve immediately or cover and refrigerate up to a few hours.